Milwaukee Mayor Tom Barrett says he’s still undecided about a run for governor. 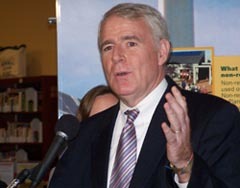 Appearing in Madison Monday, Mayor Barrett said he was surprised by Lt. Governor Barbara Lawton dropping out of the race. Still, he’s made no decision yet on whether he’ll seek the Democratic nomination in 2010. Barrett says it takes time to sort things out, but he understands that “time is of the essence” and he’ll be making a decision in the near future. With the election still a year away, Barrett says there’s still plenty of time to mount a very aggressive campaign if he decides to run. Appearing with the Mayor Barrett in Madison Monday, Governor Doyle offered his support. Doyle says he think Barrett would be a great candidate, but he’s not going to speak for anyone. Doyle says he was surprised by the Lt. Governor’s dropping out of the race. However, the Governor says he respects her decision, which he imagines was a very hard one to make. Lawton’s departure means no Democrats are officially running to replace Doyle, who announced in August he would not seek another term. Milwaukee County Executive Scott Walker and former Congressman Mark Neumann are seeking the Republican nomination.